As designers, it is very rare to feel our work is ever complete. We are always trying to make a piece perfect and we could pick at it for weeks, months and even years if you let us. Business owners often feel the same way. Nothing is ever done. Everything is constantly evolving into something new, something better. So, why is that we get so attached to out-of-date or not-so-useful-anymore website? The wonderful thing about the web, is that it is ever changing. Many of the clients we support at hello, are small businesses that simply need a presence on the web and don’t necessarily need a website with every changing content. And that is just fine. For some larger companies, revolving content is a great way to keep your website fresh and up-to-date. But, just because you are a smaller business, doesn’t mean we should let your website get stale. 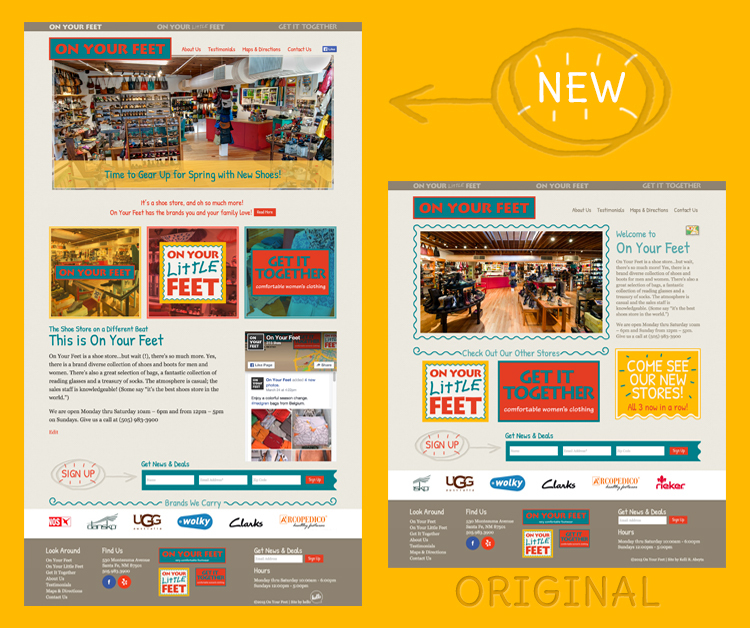 Our lovely clients at On Your Feet, recently decided their website homepage needed a facelift and we were happy to help them out with that. Their website had been live for about a year and half and it had been doing a great job for them. It is a simple site that just gives basic information for people wanting to find their stores and their analytics show a steady stream of visitors. However, when their stores got a bit of a make-over, they decided their website should get one too! With just some little tweaks to the layout of their home page, it made a huge impact in breathing some fresh life into their site! We couldn’t be happier with the new home page! 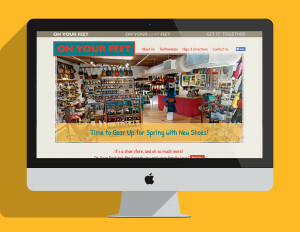 Make sure to visit www.onyourfeet.com to see it in action! Just because you might feel the need to spice things up a bit from time to time, doesn’t mean your website is bad. Is your message the same? Do you customers know who you are from your location to your website? If so, you are on the right track. But don’t get caught in a rut because you are afraid to shake it up. Web is a great platform to stretch out and grow and it’s ok to do so!